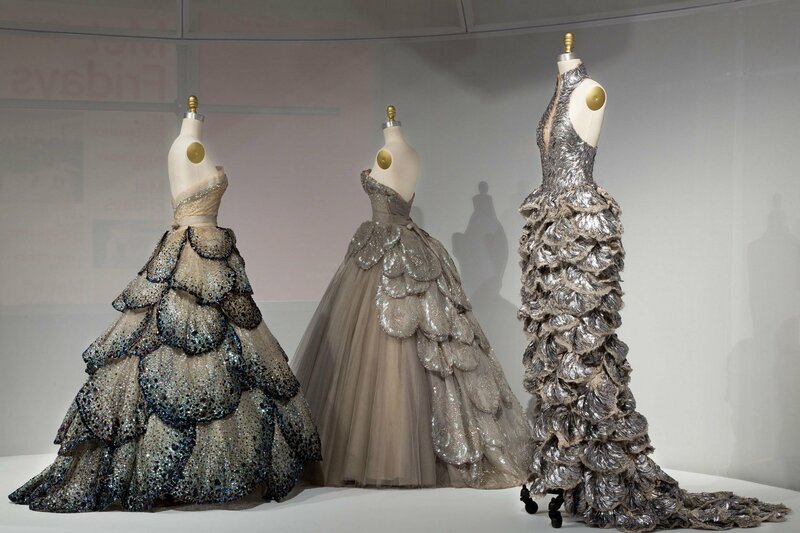 On display until September 5th, The Metropolitan Museum of Art summer blockbuster exhibition Manus x Machina: Fashion in an Age of Technology explores how fashion designers are reconciling the handmade and the machine-made in the creation of haute couture and avant-garde ready-to-wear. Fashion scholar and Address contributor Rosie Findlay used the occasion to visit the exhibition to shop for a wedding dress. Most people with a burning interest in fashion have some variation of the same origin story. We chance upon a glossy magazine, most commonly Vogue, and the sartorial awakening occurs: the beauty, the wit, the clothes. And in step with that common history, here is mine: fifteen, saving all the money I earned from working Saturdays at Southside Video to shop the designer sample sales, and poring over the pages of Vogue Australia. When you live in suburban Sydney, you can paste pictures of model Tiiu Kuik in Oscar de la Renta all over your school diary if you want, it’s not going to bring that hot pink perfection any closer to your body. But the one way to get into magnificence like that would be… one’s wedding day. And so was born the Wedding Dress Game, in which you pick out from every magazine spread the dress you would choose to wear for your wedding. In this instance, the wedding was obviously secondary to the dress. Not to mention marriage, which was so far from any thoughts of this as to be non-existent. What was pressing and important was whether you would choose the Stella McCartney for Chloé satin bustier dress in periwinkle blue or the opulent Lacroix couture inspired by the French Revolution. I never said it wasn’t a difficult game. The reason I am confessing all this to you is that this game lingers in my mind, arising from time to time in the face of exquisite clothes that, by virtue of their context or price tag, are beyond mortal means to acquire (unless you are one of Truman Capote’s swans or an actual princess, in which case, more power to you). And so it is that I found myself at the Metropolitan Museum of Art Manus x Machina exhibition, face-to-face with the first garment of the exhibition, a literal wedding dress — Chanel Couture a/w 2015— and I began to play. 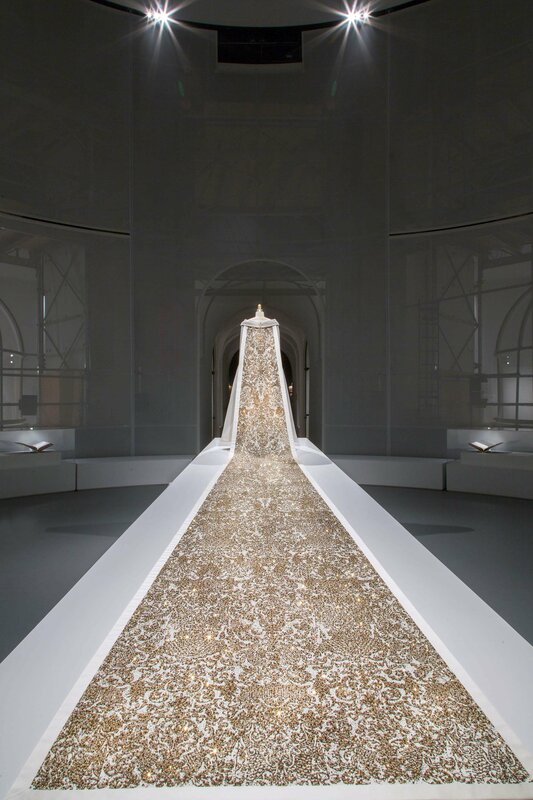 Entering a curvilinear atrium, we first encounter the train of the dress, arrayed as it is on a plinth, allowing for 360 degrees of admiration. A surprise awaits as you walk around the front and see it undulate forward (unless you’re the kind of fashion nerd who remembers that Ashleigh Good modelled this in the show while pregnant), the sculptural curves of the gown mirroring the round buttons down the front and standing in contrast to the dress’s flat, glittering train. We learn that the design on the train, described by the show’s curator Andrew Bolton as a ‘pixelated baroque pattern’, was sketched by Lagerfeld before being digitally manipulated, then hand-painted with metallic pigment, machine-printed with rhinestones, and finally, hand-embroidered with precious gems. This careful back and forth between techniques of hand and machine is the concept at the heart of this exhibition, the dynamic possibilities proffered by their cross-fertilisation triggering a range of incredible garments that often, quite literally, boggle the eye. But how gauche to take the first dress on offer as the game’s winner: no, no. So I slowly worked my way around the exhibit, taking with my eyes the measure of these lovely garments. 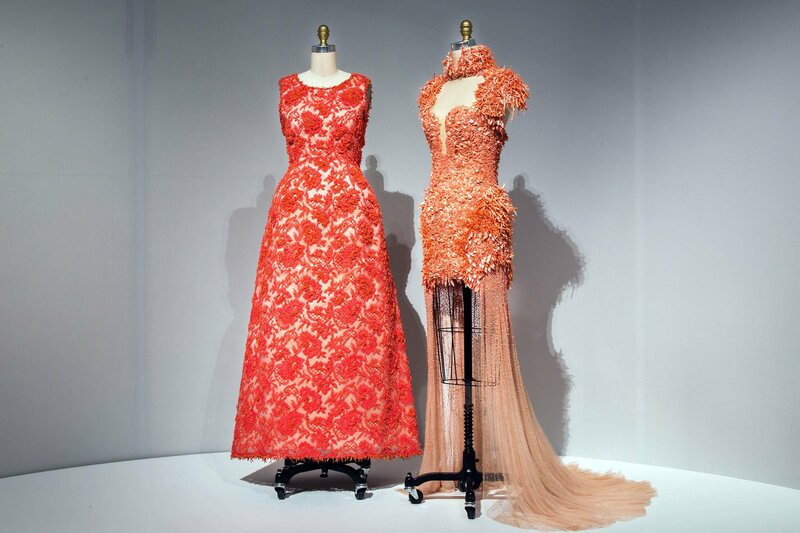 They were categorised by the technique that most prominently featured in their making— featherwork, embroidery, pleating— and the tombstones explained the different métiers that meticulously create clothes such as these, offering fascinating insights into the strands of skill that help machines further handiwork and hands retouch what machine has wrought. They were also educative: for instance, did you know that plumarius is a Latin word once used to describe both featherworker and embroiderer? Such a jammy, luxuriant word deserves at the very least to be known and savoured silently in one’s head. The Feather room ran the gamut from Hitchcockian nightmare to gliding debutante. A peach dress by Iris Van Herpen of silicon ‘feathers’ with enraged taxidermied birds emerging from each shoulder stood by a sweet off-the-shoulder floss-pink gown sprouting a nimbus of ostrich feathers. Around the corner in Embroidery, I fell hard for four dresses at once— two Pradas, a Miu Miu and a Dior— that were just the thing for the kind of eccentric city hall wedding followed by a garden party that I might be into. The embroidery on these lovelies would do the talking for you- paint your lips Schiaparelli pink, slip on some heels and off you go (or gold brogues with the Dior! See why this game is addicting? Nascent stylists, you feel me). So there were some strong contenders: I mean, it’s the Met’s summer fashion blockbuster, this was hardly a surprise. For the techy bride who wants to simultaneously show off her lithe body and her cleverness, let me present the Hussein Chalayan floating dress. You step into it, as the front is a solid bust, close the back behind you like a door, and activate a remote control so that the white arrows poised on the front of the dress lift off, spinning in the air like so many robotic dandelion fronds. For the traditional bride, might I suggest vintage Christian Dior couture: from your waist down, you will be a gorgeous froth of black and silver crusted petals, getting consecutively larger as they foam to the floor. Or perhaps you’re the kind of bride to say intimacy is overrated, as is moving my arms at angles other than 90 degrees from my body. In this case, the only choice is Iris Van Herpen’s stunning— and I mean this literally rather than fashion-hyperbolically— long-sleeved minidress, in which metal filings were mixed with liquid rubber before being poured over a cotton dress. A magnet was then hovered over the gown, drawing up all those filings to harden into the most organic looking man-made dress I have ever seen. The ridges and curls of rubber look exactly like dense seaweed, or lettuce, and I had my nose in the hem trying to absorb what was in front of me. The exhibition had a lot of Iris Van Herpen pieces, which was thrilling as I’d never seen any “in real life” before, and it made for a striking contrast to see their state-of-the-art innovation displayed alongside the craftsmanship of a number of classic 20th century couturiers such as Charles James, Christian Dior and Chanel. 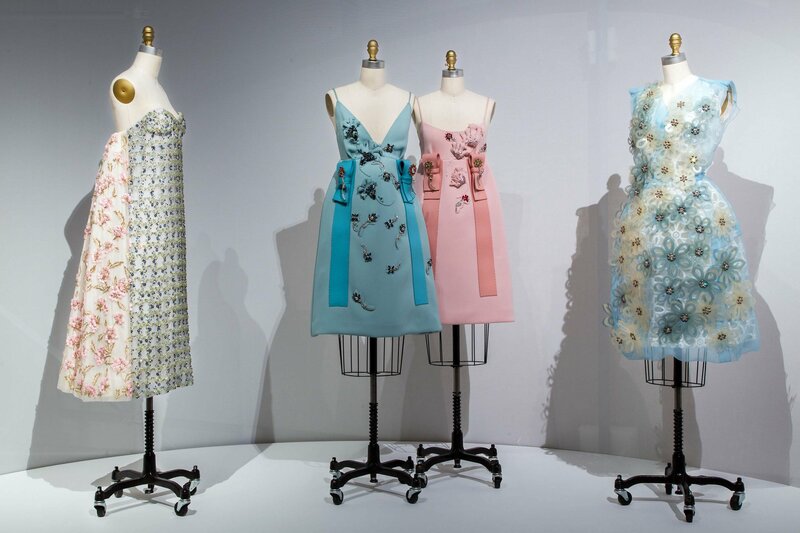 I wished there had been more vintage Balenciaga on display— to my mind, Cristobal Balenciaga is one of the all-time greatest couturiers—but I’m secretly hoping this is because the Met are planning a Balenciaga stand-alone show next year (this is a completely unfounded hope, I admit). So, where does all this leave us? 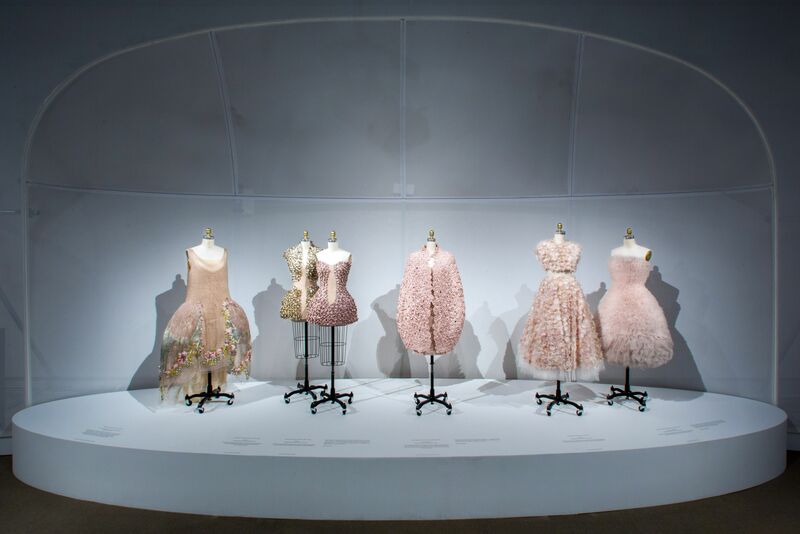 This exhibition offers an abundance, ranging as it does from sci-fi innovation to wasp-waisted sweetness, from a McQueen cape in feathers so minutely applied that it was as iridescent and flawless as a moth’s wing to a Givenchy couture dress with a skeleton subtly picked out in hand-worked lace. And yet, a wedding dress is a very personal decision. I’ll leave you to make your own selection, but for me, it had to be a John Galliano for Dior couture dress displayed in the room devoted to construction. 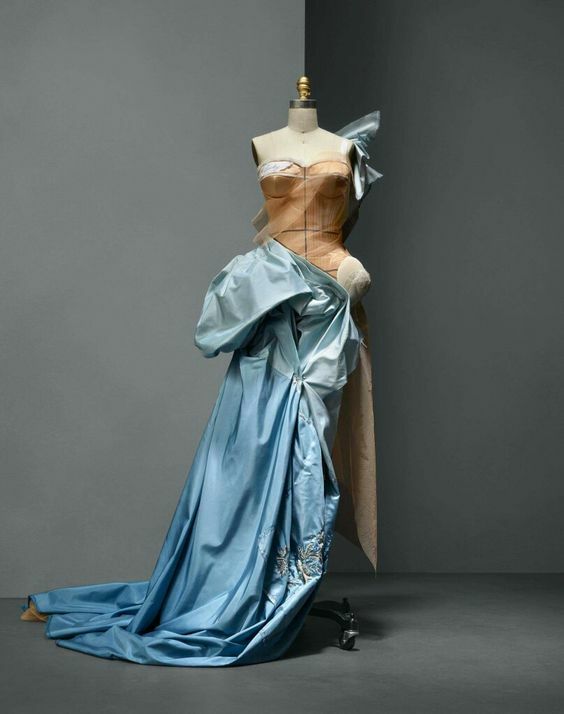 Designed to show the different crafts of couture, it is a symphony of techniques that seem to unravel over the mannequin: a pale pink bustier supported by a single ribbon strap, devolving into a cascade of blue silk that looks loosely pinned at one hip, balanced on the other side by a hip pad jutting out over pale pink tulle falling to the floor. Look closely and you see the beginnings of white flowers embroidered towards an unfinished hem, and over the right breast, a piece of couturier’s tape with ‘Lucky’ written on it. And so you would be, if you were the unblushing bride sashaying this magnificence down the aisle. But that day, it was enough to slowly soak it all in and to nod from time to time at other visitors whose faces wore the same impressed expression as my own. Sometimes it’s enough just to stand close enough to be able to appreciate the astounding work of the most inventive fashion designers, and to notice, for instance, how a Helmut Lang evening dress is pleated so delicately that its waves of organza appear to run with rivulets of water, flowing towards the floor.